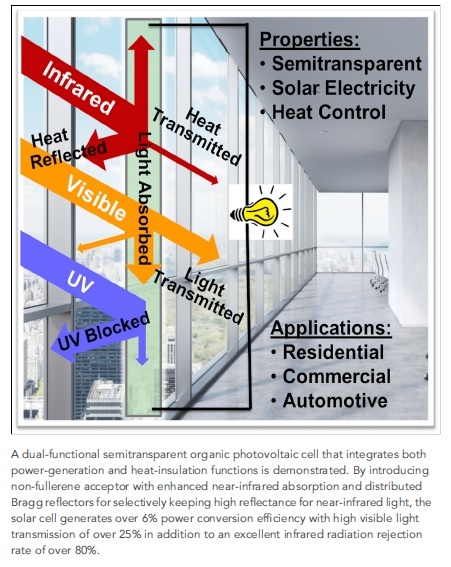 (CN) – New solar technology could turn windows into tiny electrical generators, allowing people to heat and cool their homes in a more environmentally friendly way, Chinese scientists revealed Tuesday. The new study in the journal Joule was conducted by scientists from the South China University who made a prototype of a transparent solar cell that can produce electricity without causing excessive heat. Rather than silicon solar cells, which are heavy and have a dull appearance, the team made organic solar cells “into semi-transparent, lightweight, and colorful films that are perfect for turning windows into electricity generators and heat insulators,” explained Hin-Lap Yip, the study’s senior author. The device they came up with allows visible sunlight through the window and turns back the infrared light, which is converted into an electric current. Called “semitransparent organic photovoltaic,” the technology is not commercially available on a wide scale. But the scientists are optimistic about its future applications. They believe windows installed with this sort of technology could save household heating costs by more than 50 percent, though they note the technology is still in its infancy. That figure accounts for every square inch of every window being covered with the solar cells. Yip noted they hope to eventually create a self-powered greenhouse using the organic photovoltaic technology. The heating and cooling of residential buildings plays a fairly significant role in the greenhouse gas emissions responsible for climate change. In the United States, it accounts for about 10 percent of emissions, according to the U.S. Environmental Protection Agency. By comparison, transportation and electricity production were each responsible for more than 28 percent of emissions in 2016, while industry was responsible for around 22 percent.